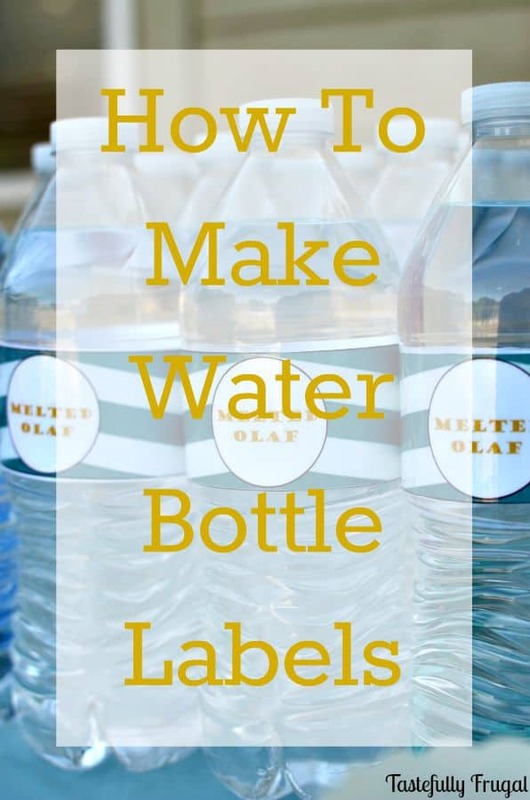 Dress up water for any party with this quick and easy tutorial, how to make water bottle labels. Hey Creative readers! 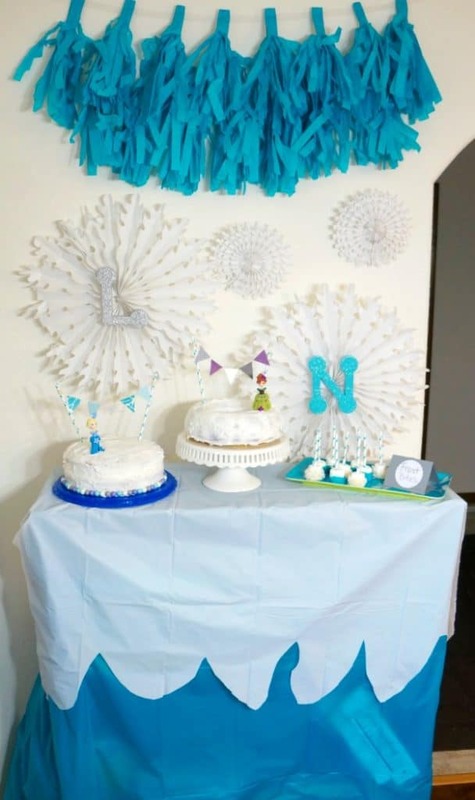 It’s Sydney from Tastefully Frugal here to share with you one of my favorite budget friendly party ideas. I love to throw parties, whether it’s for birthdays, holidays or family get togethers, I love being able to create a menu, games and tablescape with a theme. In the past 2 months we’ve had a Monsters University Party and a Frozen Party. Both were a lot of fun and both were accomplished with little to no budget. My number one tip when throwing a party on a budget is make things vs. buy things. Of course there are always going to be things you HAVE to buy, but the more you can make the more you save. 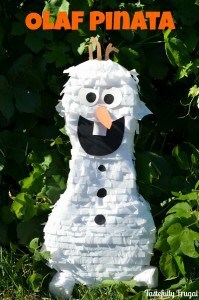 Take this Olaf Pinata for example; I saw one in the store for $20. By using poster board and tissue paper I was able to make my own for $3. The same goes for the food. But we’re not here to talk about piñatas or food are we?! 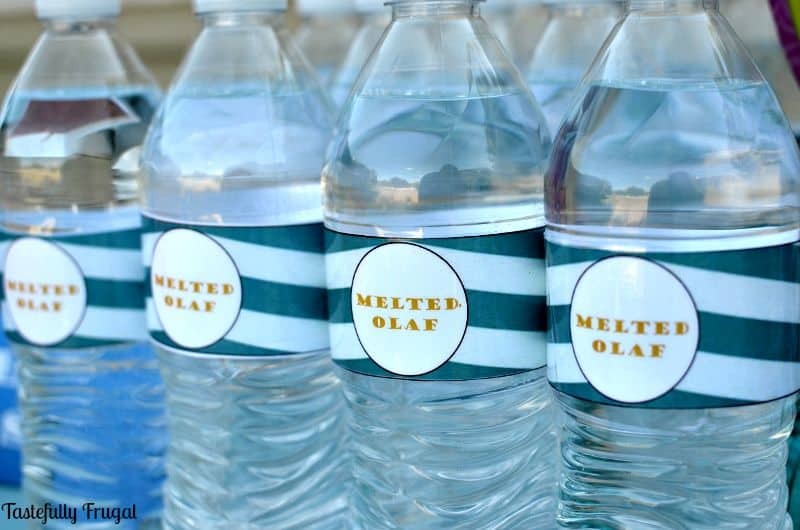 We’re here to talk about those cute water bottle labels you see at parties. You know, the ones that say “Happy Birthday” or have a cute phrase that go along with the theme. They are a great way to make a boring bottle of water really pop at a party. And they are super easy to make too! Step 1: In Word draw a text box that is 1.5″ wide x 8.5″ tall. Step 2: Click the text box so it is highlighted then go up to your toolbar, click insert, then online photos. Step 3: Search for a background you would like. 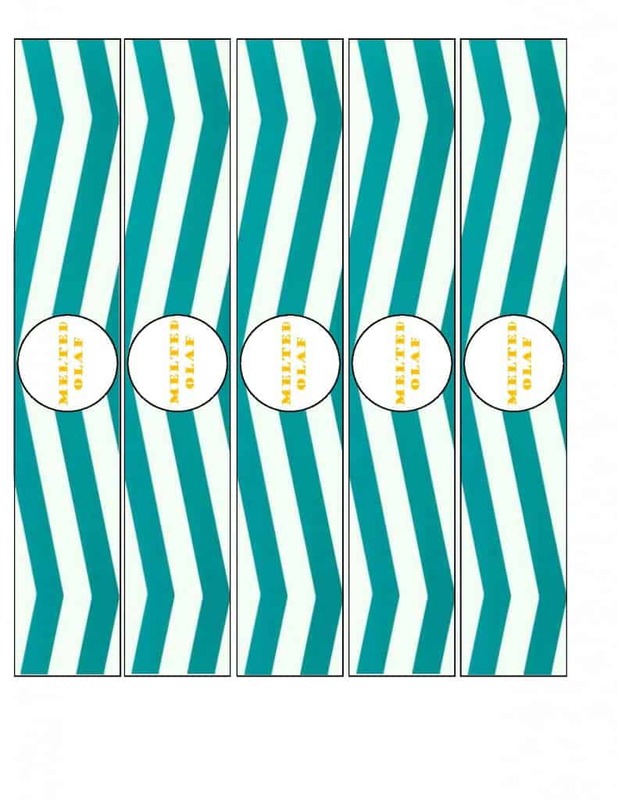 I have found general terms like “blue chevron” work best. Step 4: Rotate the image and stretch it to fit inside your text box. Step 5: Go back to the insert tab and select shape. Pick a circle from the drop down menu. Step 6: About 4″ down insert the circle and stretch it so it fits the full width of the text box. Step 7: In your tool bar change the shape fill to white and shape outline to whatever color your background is. Step 8: Go to your insert tab again and draw another text box. Draw it about the size of your circle and type your text. Step 9: Change both the shape fill and the shape outline for this text box to no fill and no outline. Step 10: Customize your text however you would like then rotate the text box so it is vertical inside your circle. Step 11: Group all three together by clicking the text box then holding CTRL and clicking the circle and then the text box in the circle. Step 12: Copy and paste 4 times so you have 5 labels on your page. Step 1: Remove current label from bottle. Step 2: Cut out labels you created. Step 3: Cut a piece of packing tape about an inch longer than your label. Step 4: Lay the packaging tape on a table sticky side up. Step 5: Place your label down on the so the design is on the sticky side. Step 6: Pick up tape and label and attach to bottle. These are so easy to make and to customize to your own party theme. I am including the labels for our Frozen Party. If you have little Frozen fans in the house surprise them with a little Melted Olaf. Do you like throwing parties? What’s your best budget party planning tip? Melted Olaf!! Bah haha… So cute, love that! Great tutorial. Thanks Jen, I know so creative right? Love this idea! Using it for our soccer team. Do you just use regular copy paper? Yes, just regular copy paper. These will be great for your team. Did you use regular copy paper? I like that you pointed out that a simple message on a bottle can make it pop during an event. I think I might get this done since the 7th party of my son will be about superheroes, so everything must be coordinated. We should get a labeling machine for that.